Why do you need to set up a fly rod in the first place? How do you set it up? These are some of the questions that angler beginners do ask. However, how to set up a fly rod is not only a problem for beginners. Many established anger also find it a challenge. I am very passionate about fishing and fly fishing in particular. This is simply because of the many health benefits it provides. Fishing does not only provide you with a good relaxation opportunity, but it is also a good Way to exercise. The repeated action of casting/reeling and climbing on rocks or boating exercises your muscles. Similarly, the deep focus that fishing requires resolves any internal conflicts, which in effect relieves you of stress. That is why I have prepared this how to set up a fly rod tutorial to equip you with the knowledge and techniques for successful fly fishing whenever you go outdoors to fish. This is what makes it possible for you to cast the fly line. I recommend a fly rod of weight 6 because it is versatile. You can use while at the edge of a lake, in a stream and a river. While fly rods of weights below #6 are lighter and therefore suitable for exerting anglers, those of higher weight are suitable for when boating and in large ves. The reel is where you store the fly line. There are three types of reels; fixed, detachable spool with a closed cage and detachable spool with an open cage. I recommend the detachable spool with an open cage because it is very easy to use compared to the rest. The fly line is a very important item in fly fishing. This is because it is what provides the necessary weight that makes it possible for you to cast. Just like with the fly rod, fly lines are available in different Weights, and the right weight should match that of the fly rod. It is also important to know that there are fly lines that only remain on Water surface when cast and those that sink into the water. Similarly, the taper of a fly line is something worth considering. A fly line with a weight tapered at the front is best if you are just starting out. This is the first piece of line that goes into the reel. This is the line attaches to the main fishing line. Backing lines are available with different strengths ranging from 20 pounds to 30 pounds. The leader is what connects at the end of the main fishing line. It is an important item that straightens out the line in the water. It is designed to be thick at the base and tapers toward the end. The tapering serves to transfer casting power upfront. Leaders are available in different length measurements and breaking strain. I recommend using a 9-foot leader with a 7-pound breaking strain for this tutorial. The tippet serves to extend the leader and manages the leader's breaking strain. It attaches to the tapered part of leader line and is designed to be less visible. This is what gives this method of fishing its name. A fly is an artificial object that mimics a live insect that fish normally feed on. It is the fly that fish will come into eating when fishing. There are different types of flies ranging from dry flies that are suitable when fishing in rivers, nymph flies suitable for deep-water fishing and lures that are designed to mimic small fish. You are now properly equipped to learn how to set up the fly rod with all the above items in place. Note that you have the option of buying all the equipment as a kit or in pieces. I recommend buying a kit because doing so eliminates the risk of buying incompatible pieces. However, you first need to decide on whether you are going to use your left or right hand when retrieving the reel. By default, you will use your left hand when winding and unwinding the line if you are right-handed. This is your first action on how to set up the fly rod. It involves loading the reel with the backing line, process known as spooling. This is unless you a reel that has already been spooled. Attach fly reel to fly rod with the winding handle on the left side (if you are right-handed). Create an overhand knot at the end of either side of the backing line, insert end of the backing line to pass through the reel and spool before pulling the knotted end outwards. Create another overhand knot using the tagged end around the other part of backing line. With the reel held in left hand, pull the other part of backing line with the right hand. The two overhand knots should snug against each other. Check to ensure that the backing line feeds through as indicated fly rod right of a fly reel. Note that your winding will be wrong if it does not feed through the guide. Watch this YouTube video to learn the practical steps on how to attach the backing line to the fly reel and the recommended knots to use. Unwind about 3 feet of the main fishing line from its package. The end you hold should be indicated as the part that goes into the reel. Double up the end section of the fly wheel to create a loop. Hold the loop with the left hand between your thumb and the forefinger; insert the backing line through the loop to a length of about 10 inches. Wrap the tagged section of backing line over the two strands of fly line. Get hold of the tagged section of backing line and push it through the loop opposite to where it initially entered. The two strands of the backing line should exit the loop to land on the same side. Pull the backing line to release the loop you have been holding on the left hand. Pull the connection between the loop and the main fishing line tightly. Watch this YouTube video to learn the practical steps on how to attach the main fishing line to backing line and the recommended knots to use. Using your right hand, create a 2' loop on the leader. Position the loop using the left thumb next main fishing line. Hold the short part of leader loop and wrap it over both the tube and the main fishing line. Check to ensure that the knot wraps are smooth before pulling the two ends of leader line simultaneously so that the leader "eats" into the main fishing line. Pull the fly line tightly. Place both the leader and the tippet in a side by side position. The ends should face opposite directions. Get hold of the leader and the tagged end of the tippet in the left hand between the thumb and forefinger. Create an overhand knot of the leader and the tagged end of the tippet in the right hand. Get hold of the resultant loop in the left hand before passing it through itself. Pull both the leader and the tippet simultaneously to pull the loop down. Hold both the leader and the tagged tippet in the left hand and the tagged leader and tippet in the right hand. Pull all the four ends simultaneously until the resultant knot tightens. Insert about 6' of tippet into an eye of the hook before winding five turns around the tippet. Push the tagged end of tippet so that it passes through the eye of the hook before Wrapping to Create an open. Pull the tippet until the resultant knot closes. Do not hesitate to point out anything that may have left out by commenting below. You are also welcome to comment just in case something is not clear for clarification. It is very important that you make use of the right equipment when learning how to set up the fly rod. It is equally important to follow the setup steps as indicated for a successful setup. 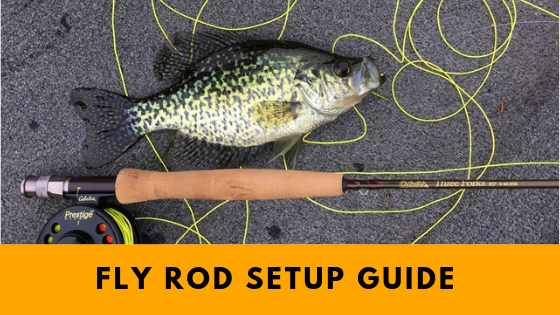 I hope you've enjoyed this Fly Rod Setup Guide. Why not share it with your friends, colleagues and your network?